This post has been updated to include additional details on Lt. Short’s service. The Navy has identified the pilot of an Embraer A-29 Super Tucano who died on Friday following a crash over the White Sands Missile Range near Holloman Air Force Base, N.M.
Lt. Christopher Carey Short, of Canandaigua, N.Y., was flying a mission over White Sand’s Red Rio Bombing Range when his prop-driven light attack aircraft crashed about 1:30 p.m. EST. Both Short and a second crew member ejected from the aircraft, according to press reports. The second crew member suffered minor injuries. Short was an active duty aviator assigned to Fighter Squadron Composite (VFC) 12, a reserve unit based in Naval Air Station Oceana, Va. 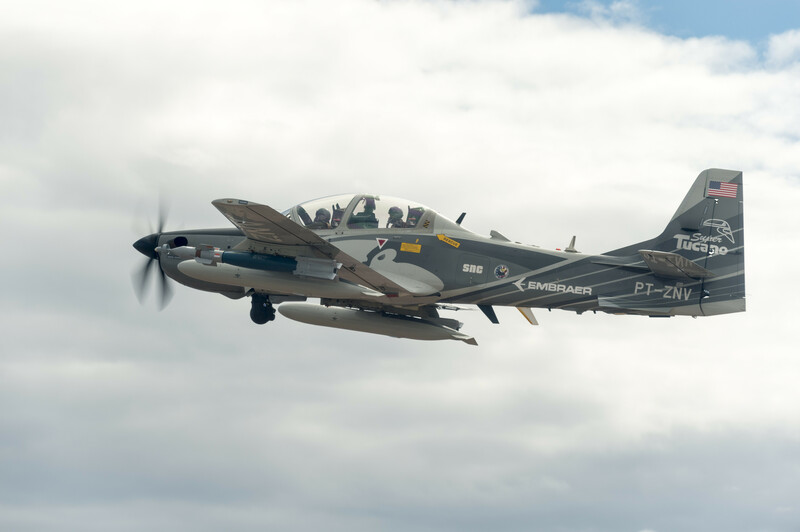 The flight was part of the Air Force’s ongoing Light Attack Experiment (OA-X) that is currently testing the A-29 and the Textron Aviation AT-6B Wolverine to see if a low-cost attack aircraft could replace higher-cost Air Force assets for certain missions. The Air Force canceled a series of test flights on Friday as a result of the crash. A request for additional information on Short’s role in the OA-X testing was not immediately returned by an Air Force spokesman. Short comissioned in 2008 and flew in F/A-18 strike fighter squadrons before reporting to VFC-12 in 2015. The following is the complete June 23, 2018 statement from the Navy. NORFOLK, Va. (NNS) — The U.S. Navy announced June 23 the death of a Navy pilot who was involved in a mishap at Holloman Air Force Base, New Mexico.